We’re not even a full two months into 2018 yet, and already the single player side of gaming has seen a huge influx of amazing titles for the PS4, both already released and coming later in the year. From fast-paced action games that hearken back to the older PlayStation classics, to long-awaited sequels and franchise returns that we could only dream about, 2018 is set to be a great year for single player PlayStation 4 games. That said, with so many out there and coming soon, it can be hard to know which ones you should absolutely be picking up as soon as you get the chance! So, today, we’re going to be counting down 13 of the best single player games for PS4 for 2018, that are either already released or being released this year. It has been so long since there was a game about the Web-Slinger that looked set to recapture the sheer entertainment and joy of being Spider-man. The PSX games got it spot on, but it was downhill since then. However, that seems like it is finally about to turn around with the upcoming release of Spider-man for the PS4. With the game taking place 8 years into Peter Parker’s life as Spider-man, you can expect loads of incredible web moves and an exceedingly well-balanced combat system to boot. Add to this the open world and the fact that you’ll be able to play as Peter without the suit, and even MJ in parts, and you’ve got a great setup for the awesome Spider-man game that we have all been waiting for! The E3 2017 gameplay trailer blew everyone’s expectations wide open, and this is one game that looks like it might actually live up to the hype it has generated. Quantic Dream has made quite the name for themselves in the last two console generations. With games like Heavy Rain and Beyond: Two Souls, they’ve pretty much put themselves on the throne of interactive storytelling through gaming. So when the trailer for Detroit: Become Human popped up, we all knew we were in for something special. An adventure game in a semi-cyberpunk world where your decisions and actions have immense consequences on the storyline progression? That sounds like an absolute winner in my books, especially when you through in the insane graphics and beautiful soundtrack. If the trailer is anything to go by, this is going to be one of most detailed storylines in gaming history, and you’ll have a direct and permanent effect on how it plays out. Add to this the fact that there is no actual “game over”, with the story carrying on anyway if one of the characters dies, and you’ve got the recipe for a truly unique game that will likely blow you away. Can you believe that the last time Monster Hunter was released on a non-portable console outside of Japan was back in 2004, on the PlayStation 2? That’s 14 years without a home console release in the West, skipping an entire console generation in the process. So, when it was announced that Monster Hunter: World was coming to the West on PS4, the hype levels skyrocketed! Considering that it is an open-world role-playing game, in a similar vein to The Elder Scrolls or Skyrim, but with a distinctly J-RPG feel, the levels of excitement for the game shouldn’t have come as a surprise. Playing as a hunter, appropriately, you take up a variety of quests, facing down everything from small creatures to dinosaurs and dragons. On top of this, each monster has different ways that it can be subdued, meaning that everyone will have a different experience playing the game. If you were a fan of Skyrim or other such open-world RPGs, but always wanted to be able to “more”, than this is game for you! 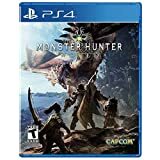 From cooking and crafting that actually feels a part of the game world, to the variety of ways to progress through fights and quests, Monster Hunter: World offers an incredibly in-depth take on the open-world RPG genre and has already garnered a huge following.